Peer review files and essays allow you and your fellow students to grade and review one another's assignment submissions. Your own grade for such assignments may depend, in part, on your interaction with their work. The overall assignment grade is divided among the various requirements set up by the instructor. In the above image, the assignment is worth 100 points, which are divided among the four requirements. Some of these requirements depend on the assignment's settings, which you can review under Info on the assignment's page. Submission grade: The score given to your file or essay by the instructor. You can receive partial credit for this requirement. Number of reviews is at least: You must review at least this many of your classmates' submissions. Average peer grade/is at least: If the instructor lets students grade one another's work, this is called the peer grade. 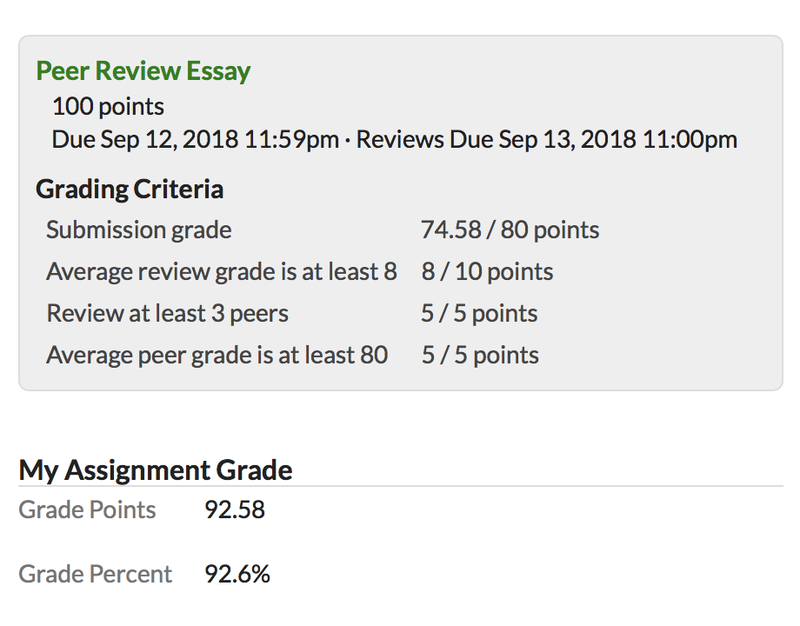 The average peer grade is counted like the submission grade; the at least version means you must meet a minimum average peer grade to get those points on the assignment. 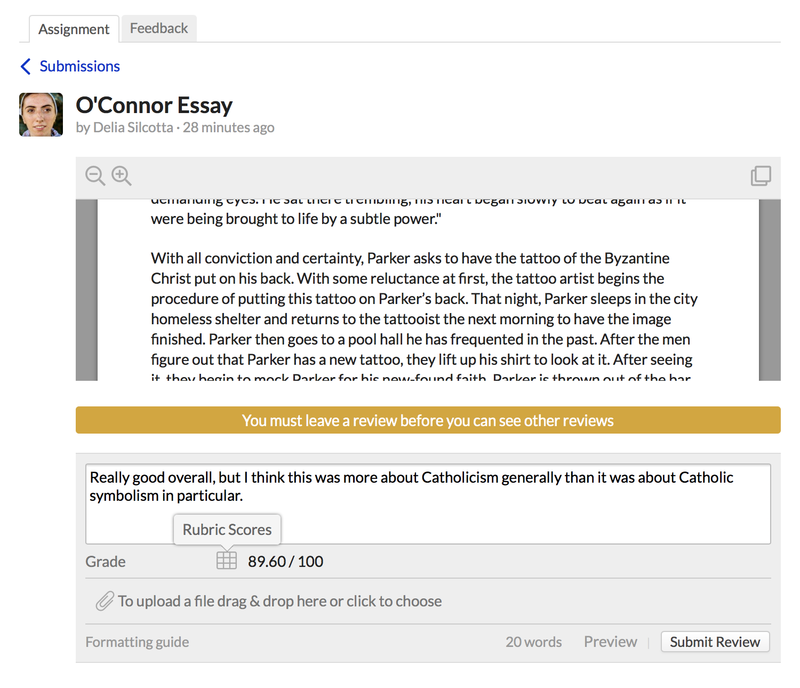 Average review grade/is at least: Reviews are the comments you leave on your classmates' submissions. If your instructor wishes to grade reviews, this requirement will figure those review scores into your assignment grade. Submitting your assignments works just as it does for any other file- or essay-type assignment. Upload a file in the assignment feed. Compose and submit an essay using the text editor. The process of grading and reviewing peer submissions will vary depending on the options your instructor is using for the assignment. Check the right column of the screen to see what's expected of you. If submissions are visible to students, you'll see a list of your peers' submitted work. If you must review randomly-assigned submissions, click Review a peer. If you're required to submit your own work before viewing your peers', do so; afterwards, you'll see one of the above two options. When viewing the submission, below the document viewer you'll find a text area where you can leave comments on the assignment. If peer grading is enabled, enter a grade (or use the rubric). When you're done, click Submit Review. After submitting your review (and grade), it will display below the submission. Click to edit or delete your comment. 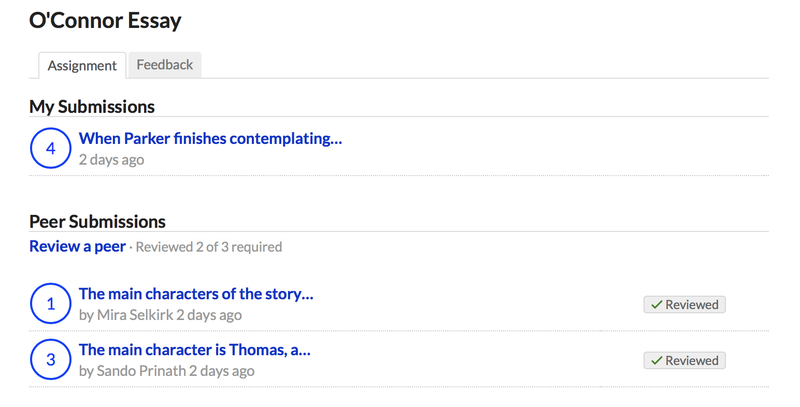 (If you want to change the grade you entered, you'll need to delete your comment and then add a new one). If there are peer grading requirements, your grade will be factored into your peer's assignment grade. After your assignment has been graded, you'll see your grades and requirement scores in the right column of the assignment page. Click the link to your submission under My Submissions to see comments, peer grades, and comment grades. Click the Feedback view to see comments from your instructor.